By looking at the data thru time what becomes evident is how influential the directional move in U.S. fiscal policy is on the value of the U.S. dollar. Late 1990’s – the U.S. deficit was contracting and actually reached a level of surplus leading into the year 2000. The budget surpluses lead to a steady decline in new inflows into the U.S. market to finance the U.S. debt. The financial strength of the U.S. government propelled the dollar higher. In the inverted world of being the reserve currency for trade throughout the world, a strong U.S. fiscal position was transmitted into the market as higher interest rates as money was flushed into the equity markets seeking higher returns. During this time period, the percentage of ownership of U.S. Treasuries by foreigners increased until the April 1999, and there was a sharp reduction throughout the remainder of the year. The Federal Reserve actually was the buyer of last resort in the sell-off. 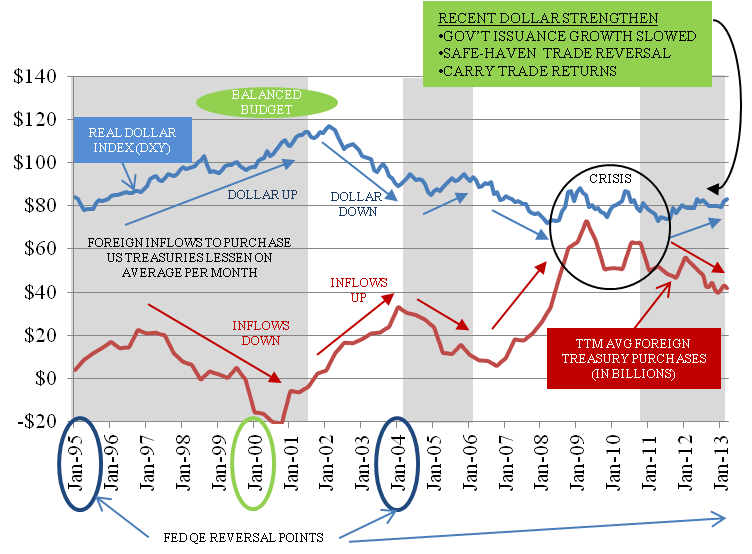 Early 2000’s – In the early 2000s, there were multiple easing moves by the Fed which logically lead to a dollar decline. But the monetary easing did not necessarily drive the dollar lower. It was the fiscal policy consisting of the Bush tax cuts and other war-time fiscal policies which are more strongly correlated to the decline as it lead to a flow of financing from foreign investors into the U.S. During this time period ownership of U.S. government debt by foreign purchasers increased from 30% to 40% of the total market for U.S. Treasury securities. All of these sales of securities to finance the U.S. government actions were done at low yields. Again, this is the opposite of what might be expected – low rates at a time when the U.S. high financing need was high, and U.S. fiscal spending was expanding. Reversal in early 2004 – The distinct reversal on the chart in early 2004 corresponds to the point in time that Alan Greenspan reversed monetary policy and raised the Fed Funds rate quickly over a very brief time period. Treasury investments at that point became more attractive relative to other investments worldwide, and the dollar responded to the action. Again, the flow of funds data is interesting. At higher rates, foreign investors slowed their level of purchases, and the dollar strengthened. 2006-2008 – The strengthening of the dollar from the Greenspan move to raise rates in 2004 was short lived. The U.S. government continued to grow the level of fiscal financing needed to fund the war-time needs as well as to handle the growing difference between tax collections and domestic outlays. The funding gap was closed by a combination of Federal Reserve purchases (QE), but more generally from foreign purchases of U.S. Treasuries. Foreign ownership of U.S. Treasuries increased during this time period from 42% to 48% (and it has remained at or near 48% through March 2013). Where are we today – June 2013? The inverse relationship between the flow of funds from overseas investors and the value of the USD was in the aftermath of the financial crisis of 2008. Immediately post crisis as the US fiscal policy demanded more dollars, the dollar actually strengthened as the U.S. dollar became a safe-haven for foreign investment. As the safe-haven trade was increased and decreased in the years since 2008, the dollar has generally been positively correlated to the inflows and outflows of foreign investment. In total, the absolute percentage of foreign ownership of treasury securities has remained in the range of 46-48%. The combination of these events have lead to a situation in which on a relative basis, the U.S. is in a much different position relative to Japan and Europe than it was as recently as the end of 2012. These relational changes began to reverberate through the markets in May 2013 and the normal currency relationships between Japan – Europe and the U.S. seemed to be returning to past relationships. The better U.S. fiscal position has lead to a lower demand for investment from all potential sources, U.S. public investors, foreign investors and the Federal Reserve. A lower relative U.S. government financing need has lead to a general uptrend in the dollar. The recent Japanese policies have lead to a major weakening of the Yen and the carry trade of borrowing at low interest rates and investing in higher interest rate markets which have a strengthening currency is back in vogue. However, in contrast to the past, the available pool of U.S Treasuries for the carry trade is currently restricted, not just because supply is lower, but also politically based on G7 and G20 agreements, so the investment funds are flowing into other markets, primarily equity markets. As for Europe, a less austere economic environment appears to have put the incentive in place to unwind positions in USD based government securities – a/k/a the safe haven trade. This is the likely area where funds will foreign funds will flow out of U.S Treasuries. The combination of these factors has worked to trigger a substantial move upward in Treasury interest rates in May 2013. a substantial rise in U.S. stock markets, all at a time when the dollar is increasing in value. The market variables which have lead to a present strengthening of the USD is reminiscent of the 1990s. The U.S. budget move to tighten fiscal policy is similar to the way that President Clinton entered his second term. A lower "relative" need for financing of the U.S. government debt on a worldwide basis has led to a lower financing need from foreign purchasers. The excess funds have begun to flow into private investment activity and the stock market U.S. stock market has increased. As the fed withdrew accommodation in 1994, interest rates moved up, but the economy expanded and the dollar power higher as rates and fiscal policy both were both conducive to strengthening. Is the U.S. in a similar position today? In my article, 6Fed Tightening Points Examined, What Happened 5/27/13 , I provided insight on the economic and market variables that were in place that enabled the economy to flourish after the Fed removed its policy easing in 1994. Certainly this is the position we would like to be in today as Fed policy begins to reverse. However, I am seeing a major risk in the numbers that investors and traders need to keep a close eye on. The issue is that as we enter the Fed policy withdrawal point of QE, the market valuation as measured by the DOW (DIA) or S&P500 (SPY) indexes relative to the size of the U.S. economy (GDP measured in Billions) is far more expensive than it was in 1994. In 1994 the relationship to the Dow Index was .54:1 and today it is .97:1. In short, there is not nearly as much upside in equity values when the two market scenarios are compared. What situation is probably a better relative comparable? The situational variables in June 2013 on an economic standpoint don’t predict that the Fed can withdraw QE at this time. However, interest rates moved up in May in spite of the large easing program. What is going on? This confluence of current market events leads me to the year 1999 scenario when interest rates were raised by the Fed, but QE continued throughout the time period when rates were increased. In other words, monetary operations were very active and rates went up anyway. The key point about this time period is that foreign ownership of U.S. securities were undergoing a rapid decline at the time – a sell-off. Percentage ownership of U.S. Treasuries by foreigners from April 1999 to January 2000 fell from 34% to 29%, a significant 5% drop. The Fed’s operations were not large enough at the time to off-set the outflow, and consequently interest rates went higher. The outflow in this case actually did not result in dollar strengthening; it began the trend toward a weaker dollar. I point this scenario out to readers because as we head through this year, the directional flow of funds is likely to be a key indicator of whether the U.S. stock market can remain at the levels it is trading, just as it did in the year 2000. The foreign percentage ownership of U.S. Treasuries is at an all-time high of 48.3%, and any movement to return a portion of these funds, even on the margin, will drive rates up from the historically low levels because there are no likely buyers except for the Fed, and they have a stated size of purchase plan which is going to go down in the future. The stock market in 2000 delayed any sell-off as long as the Fed was still active in buying Treasuries. However, as rates went higher and the economic outlook dimmed, the stock market unwound into the fixed income market once rates became attractive. At the present time, the relative trade of U.S. Treasuries to stocks is not attractive to most private investors. It only looks attractive if you are predicting a stock market meltdown driven by deflation – similar to the Japan crash in the 90’s. I am not at that breaking point yet – but it might become the scenario unfolding as the year progresses. For the intermediate term, there is a strong rationale to continue over weighting equity or near-equity type investments and under weighting high duration plays and accumulating a higher proportion of cash to balance risk. Being more selective in equity selection is also advisable because the aggregate index as it approaches a top will have many companies which will perform worse as interest rates rise. But as the year progresses, if there is a noticeable continued run up in rates ahead of the Fed reducing QE, it is very likely a signal of an outflow of foreign investment in U.S. Treasuries. Maybe this is what started in May 2013 – when the data is published in July I will be able to see. In 1999 the sell-off lasted from April to January. Post January, the market correction that everyone was sure was going to happen at the time finally started, and money flowed quickly into the fixed income market. Given the all-time high level of the stock market today wit weak economic fundamentals, this is a very likely path I currently see unfolding. My on-going forecast is that we are not yet at the point that that the stock market can unwind – but I plan to watch the trend in the strength of the dollar and foreign investment flows as a leading indicator going forward.